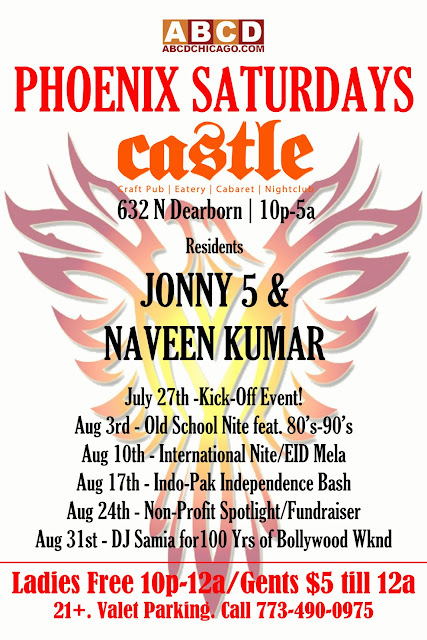 ABCDchicago: Phoenix Saturdays - Weekly Desi Party! Phoenix Saturdays - Weekly Desi Party! ABCDchicago.com invites you to a new Saturday Night Bollywood/Bhangra/Mainstream Party! Debuts This Saturday, July 27th! Ladies Comp'd, 10p-12a and Gents $5, 10p-12a. Call Hamed @ 773-490-0975 book groups, tables, and to host charitable events.